As workers in a pie factory, players are competing for the big promotion to be announced in two days time. In order to be selected, players must box the most value in pies and influence the higher-ups to choose them. Mechanically, Pie Factory's heart and soul is the Assembly Line from which players draft ingredients for their pies. Each ingredient takes a certain amount of time to prepare and player order is rearranged each round to reflect time taken, so players must time their actions just right to make sure they get the ingredients they most want. To build a pie, players splay filling cards on top of crusts cards, and even toppings on top of the fillings. Players have to decide when they want to box/score a pie as is or try to compete for a majority in scored cards with Influencers(the Higher-ups). At the end of the game, a combination of boxed pies and influencer icons will win the game! 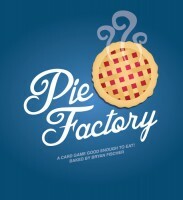 Add a Review for "Pie Factory"